Now that we have seen what it looks like when the picture is purely pencilled, now check it out after the inking job has been applied to it. It really makes a dramatic difference, no? The one obvious advantage I have in an inked piece is that it simply pops more. Everything looks bolder, more vibrant. There is also more of an opportunity to make the piece more realistic. For example, the tentacles have a more metallic shine to them which gives that sense of realism. That kind of detail could be not as apparent in a pencilled piece, where the fuzziness of the pencils has more of an impressionistic feeling to it. On the flip side, inking also can allow me to make things look less realistic too. 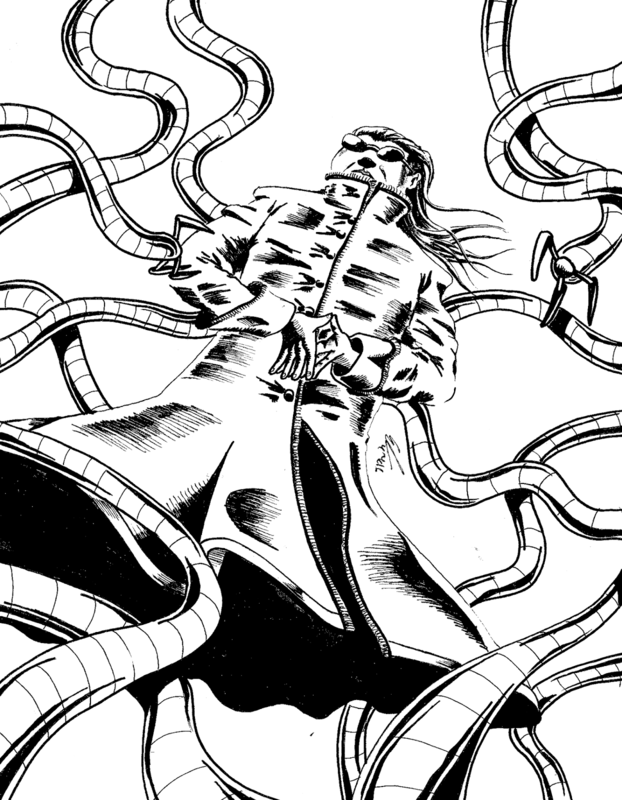 Looking at the underside shadowing of Dr. Octopus' trench coat, I decided to make it a flat black, even though, realistically the underside of the coat should still have gradients of shadows. However, I elected to make it flat black in order to give Dr. Octopus this slightly weird, otherworldly feeling-as if he is not totally human.